Orlando Chamber Choir and director James Weeks invite you to a grand concert-pique-nique on the banks of the Seine. 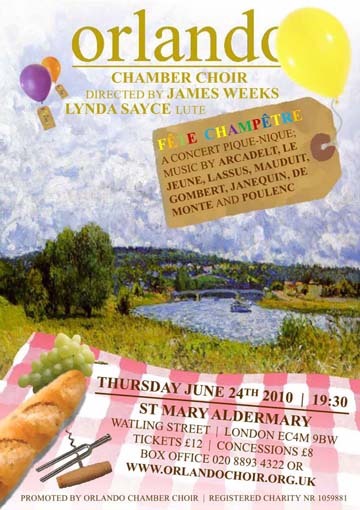 Together with renowned lute player Lynda Sayce we will host a Fête Champêtre of mouth-watering French choral music ranging from aged Renaissance to Poulenc's soft and creamy Sept Chansons. Further highlights of our bucolic spectacle are chansons by Janequin, Di Lasso, Arcadelt, De Monte, Gombert and Le Jeune and airs de cour by Mauduit.